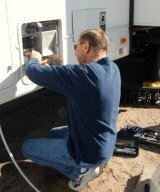 What is the plug on the back of 2009 40ft 5th wheel RV for? Hello, I have a real stupid question I am needing answered. My mother lives in a 2009, 40ft Sandpiper 5th wheel RV with 3 slides and runs on 50 amps. We just moved her onto our property because she is has dementia. When we moved her, the 50 amp power was plugged in but so was an extension cord plugged in from a 110 volt male receptacle on the rear of her RV into the power supply box. Can someone tell me what this 110v male receptacle is used for. It seems to be providing power to something in her trailer.